Disponible en Amazon, Dugu lo importa a Chile. Piscifun. - Aviso de responsabilidad legal:WARNING: This product can expose you to chemicals including TDI which is known to the State of California to cause cancer and birth defects or other reproductive harm. For more information go to www.P65Warnings.ca.gov. - Garantía:Worry-Free Warranty! All Piscifun customers enjoy 30 Day Money Back Guarantee. At Piscifun, we believe in our items. That's why we offer 3-year limited warranty and provide friendly, easy-to-reach support. You have no risk to try Piscifun products. THREE-YEAR WARRANTY - Your reel has been set at the factory for left-hand retrieve. To convert your reel to right-hand retrieve, please contact us for guidance. SOLID and LIGHTER WEIGHT - Precision CNC-machined 6061-T6 aluminum alloy for high-impact durability; Larger CNC hollow design makes the reel lighter than ordinary ones. SILKY SMOOTH DRAG - Multi-disc cork and stainless steel drag system with one-way clutch bearing for smooth immediate drag engagement. Accurate click drag and silent retrieve. CORROSION RESISTANCE - Hard anodized for surface protection increases abrasion resistance and weather fastness; Cold forged and tempered for superior strength and rigidity. Mid-ARBOR DESIGN - Reducing line memory while also facilitating lightning-quick line pickup. 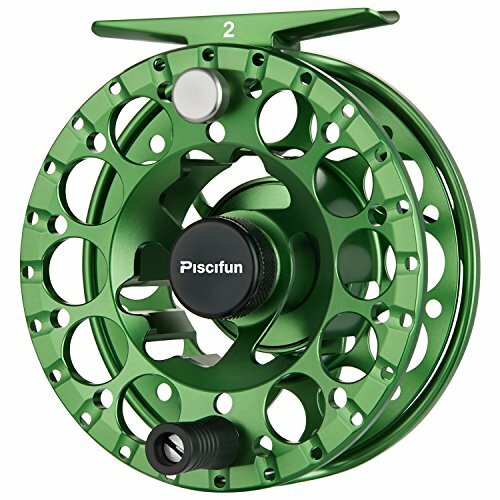 PISCIFUN Reels has always stood for quality fly reels, and the new SWORD is the perfect example of this value. The Piscifun Sword 2 features a mid-arbor design that reduces line memory while also facilitating lightning-quick line pickup-something that is vital when trying to keep up with big fish on blistering runs.